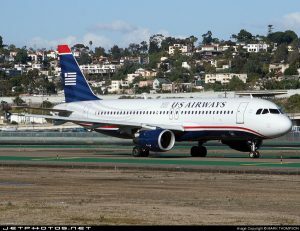 8 years ago today, US Airways Flight 1549 (N106US) was a scheduled passenger flight from LaGuardia Airport, New York City to Seattle-Tacoma International Airport, Washington with a stopover at Charlotte Douglas International Airport, North Carolina. The Airbus A320-214 was carrying 150 passengers and 5 crew members. 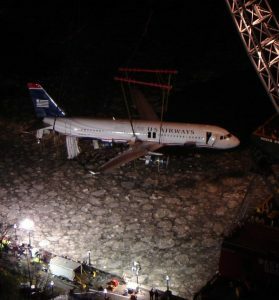 N106US, the accident aircraft involved taken on 26 December 2008. 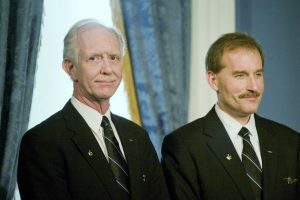 The cockpit crew of US Airways Flight 1549 consisted of Captain Chesley B. Sullenberger, 57. Sully is a former fighter pilot who had been an airline pilot since leaving the United States Air Force in 1980. At the time of the accident he had logged 19,663 total flight hours, including 4,765 in an Airbus A320; he was also a glider pilot and expert on aviation safety. The First Officer was Jeffrey B. Skiles, 49. Skiles had accrued 15,643 career flight hours, but this was his first Airbus A320 assignment since qualifying to fly it. There were also three flight attendants aboard. US Airways Flight 1549 was cleared for takeoff from LaGuardia’s Runway 4 at 15:26 EST. The first officer was flying. As the aircraft reached an altitude of 3000 feet the crew saw a formation of Canada geese. Before they knew it, the windscreen turned dark brown and several loud thuds were heard. Both engines began to lose power and there was a burning smell. The captain took over control of the aircraft while Skiles worked the checklist for engine restart. Sullenberger radioed ATC about their emergency situation: “Aaah this is Cactus 1549. We lost thrust in both engines. We are turning back towards LaGuardia. Air traffic controller Patrick Harten told its tower to hold all departures and directed Sullenberger back to Runway 13. Sullenberger responded “Unable”. Sullenberger asked if they could attempt to land at Teterboro Airport controllers obtained permission for landing on Teterboro’s Runway 1. 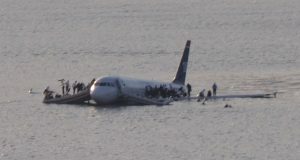 Sullenberger responded “We can’t do it… We’re gonna be in the Hudson”. 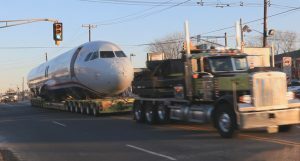 The aircraft passed less than 900 ft above the George Washington Bridge. Sullenberger commanded over the cabin address system, “Brace for impact”, and the flight attendants relayed the command to passengers. At 15:31 EST the aircraft made an unpowered ditching, descending southwards at about 130 knots into the middle of the North River section of the Hudson tidal estuary roughly opposite West 50th Street in Manhattan and Port Imperial in Weehawken, New Jersey. Flight attendants compared the ditching to a “hard landing” with “one impact, no bounce, then a gradual deceleration. The ebb tide then began to take the plane southward. All occupants evacuated the airplane, climbing onto the wing and entering escape slides. Coast Guard vessels and commuter ferries rescued everyone on board. There were five serious injuries including a deep laceration in flight attendant Doreen Welsh’s leg. Seventy-eight people were treated for minor injuries and hypothermia. The partially submerged plane was moored to a pier near the World Financial Center in Lower Manhattan, roughly 4 miles downstream from the ditching location. The left engine, detached by the ditching, was recovered from the riverbed. 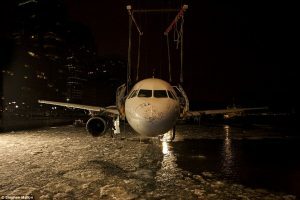 On 17 January the aircraft was barged to New Jersey. 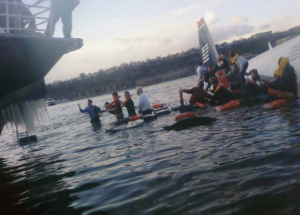 The incident came to be known as the “Miracle on the Hudson”, NTSB member described it as “the most successful ditching in aviation history.” The pilots and flight attendants received the Master’s Medal of the Guild of Air Pilots and Air Navigators for a “heroic and unique aviation achievement. In 2010, the damaged plane (excluding the excluding its engines) was acquired for the Carolinas Aviation Museum in Charlotte, North Carolina which held a reception on June 11 to commemorate the arrival in Charlotte of the plane’s body with Sullenberger as keynote speaker and the passenger invited. 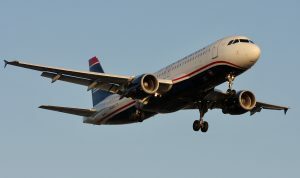 The investigation into the ditching of US Airways Flight 1549 was led by the National Transportation Safety Board (NTSB). 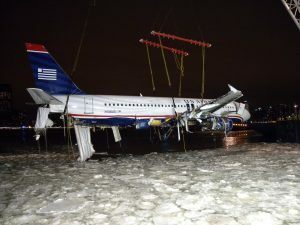 The Federal Aviation Administration (FAA) approval of ditching certification without determining whether pilots could attain the ditching parameters without engine thrust. The captain’s resulting difficulty maintaining his intended airspeed on final approach due to the task saturation resulting from the emergency situation. The fortuitous use of an airplane that was equipped for an extended overwater flight, including the availability of the forward slide/rafts, even though it was not required to be equipped. The proximity of the emergency responders to the accident site and their immediate and appropriate response to the accident.